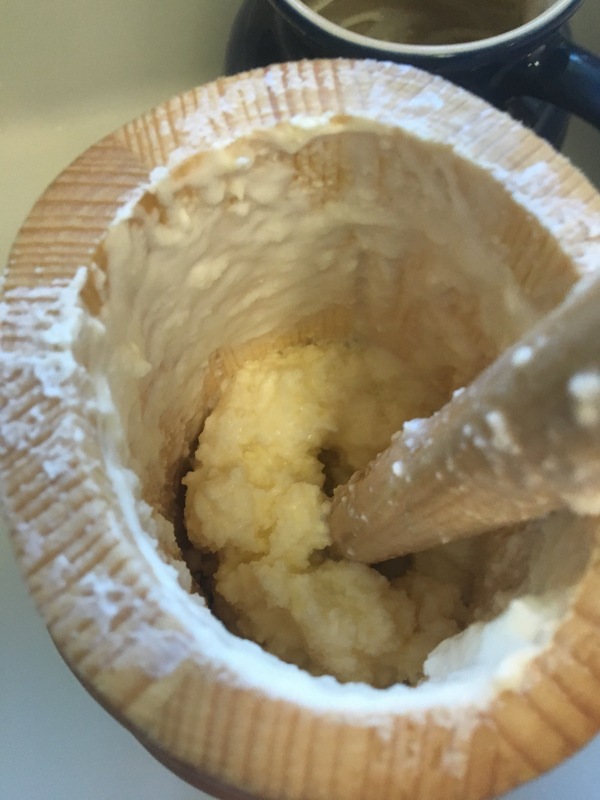 Adventures in Home Dairying: Churn Down for WHAT! Aleit went on an adventure in Europe, and came across some butter churns. Because we live in the future, she posted about it on Facebook, and I cried out my desperate need for a butter churn. 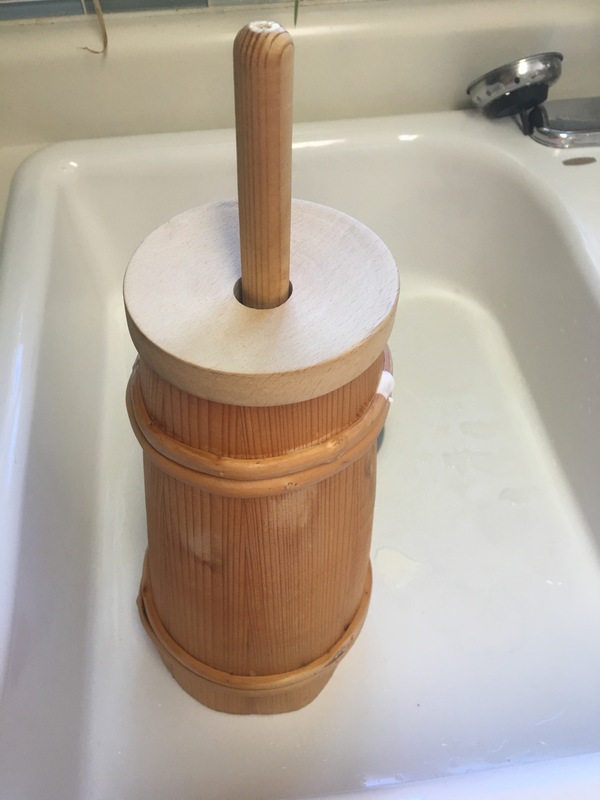 In case it’s not coming through in text, I want to say I am INCOHERENTLY EXCITED about the fact that I have a butter churn, a handmade one with beautiful wood hoops no less. OMG THIS BUTTER CHURN! Much churn. Very butter. So excite. Wow. Once I got my new friend home, I soaked it in water until it swelled enough to seal itself. Then the fun of making butter began. Use great ingredients. The best butter comes from the best cream. I like Organic Valley personally as I can reliably get it and their cows are pastured. Cows that live on pastures are probably happier, in as much as cows can be said to be happy, and they produce much higher quality dairy. Cows that eat a lot of grass also make prettier, more deeply colored cream. Local and fresh from the farm would be ideal, but that is harder to manage. You need heavy cream. Look at the label of whatever you buy — a lot of whipping cream has mono- and diglycerides added. These aren’t bad, but they are added to help cream turn into whipped cream, not butter, so they can work at cross-purposes to your end goal. Culture the cream before churning. This makes the finished butter taste amazing, it’s more historical, and it makes the butter churning go faster. It’s also dead easy: buy cultured buttermilk and add some to the cream, then let it sit. I usually add a half pint of buttermilk to a quart of cream because those sizes are both easy to obtain and I’m lazy. The half pint of buttermilk could probably culture up to a gallon of cream. I put both in a pitcher or large jar or a jug and drape a cloth over the top or losely seal with waxed linen, then let it sit out on the counter overnight. I have done this at events, too. By the way, quick rant about culturing dairy here: historically, this just happened. Leave the cream out overnight, have nicely soured cream the next day. Leave milk out overnight, have clabber the next day. Dairy is naturally full of lots of bacteria, some great and some definitely not. The tradeoff of pasteurization is you can’t just set your milk or cream out to clabber it like they did in the old days, but you also are much less likely to die from a horrifying pathogen from drinking raw milk. Tradeoffs! If you’re playing around with homemade fresh cheese, the kind that you add lemon juice or vinegar to to curdle it, do an experiment: add a half pint or even a pint of buttermilk to a gallon of whole milk, let it sit overnight, and the next day you can make it curdle by just bringing it to a boil. Pretty neat! Don’t overfill your churn. I usually gleefully ignore this. But the churn should be less than halfway full for minimal splatter. Transfer to a bowl and bring the butter together in one blob (I’m using my butter paddles), then (not pictured) drain off the buttermilk, set it aside, and wash the butter by kneading it in ice cold water. Buttermilk is great in a lot of recipes, especially baking. 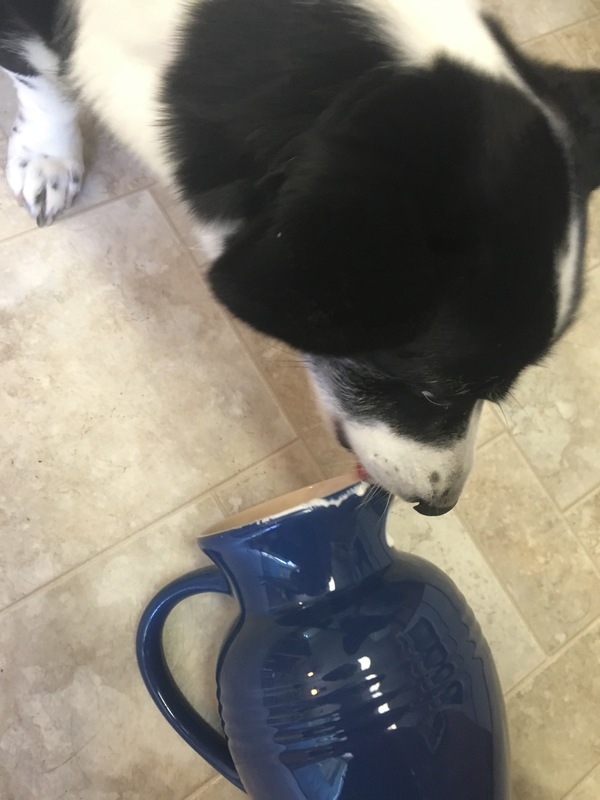 My dog loves if. I’ve fed it to my chickens. Medieval people probably just drank it. I once tried watering some down, like oxymel or any of the other vinegar water variants from period. I was not a fan. I like to sprinkle on flakes of salt but you can also just salt your butter. 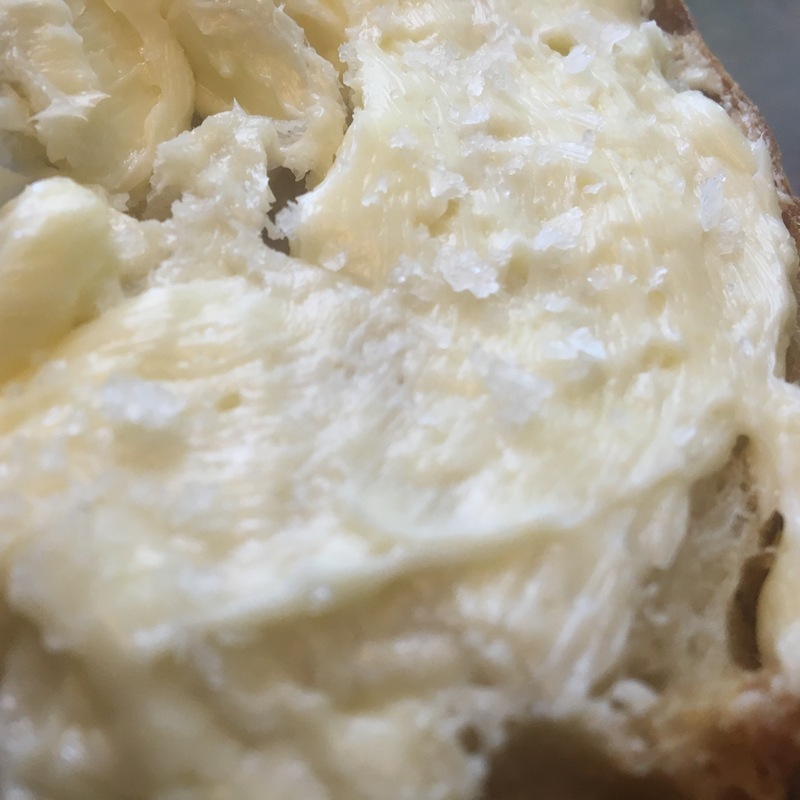 Premodern butter probably had up to 10% salt as a preservative — this was washed out prior to using the butter — but you can add as much or as little as you like. Butter doesn’t really store well. I mean, it does, but the best tasting butter is fresh. 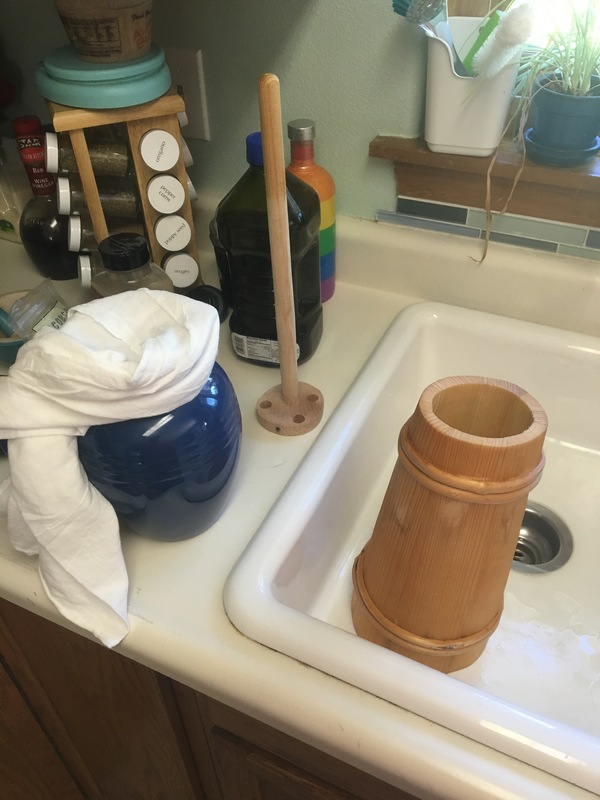 If you’re in An Tir, I plan to bring my churn to September Crown and churn butter while I hang out in the Publike House so you can see it in action. Just because I want to make people hella jealous, these churns were handmade and very cheap. I love you Europe! YUM!! I so want to taste that butter! Awesome article! 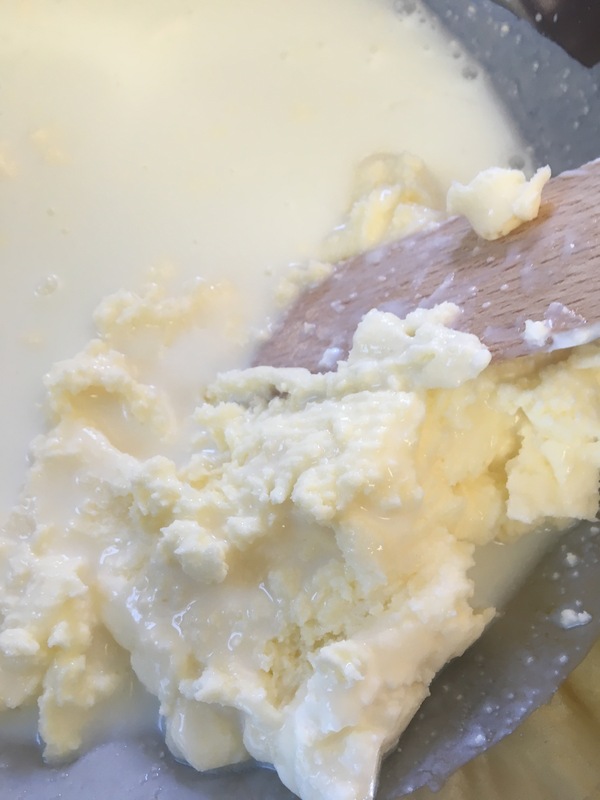 I appreciate your writing it down as a step-by-step for those of us who want to try….and I had *no* idea about culturing the milk before making a cheese…. been doing those for 20 years and never tried that…. I have often made butter using an electric mixer or food processor (~2 minutes from cream to butter, and works well for small batches (e.g. 200 to 300 ml of cream), but I have never tried a butter churn. I would be interested to know if there is a difference in butter texture and/or quality between the two approaches, if you feel for doing a side by side comparison. In Norway they sell one brand of butter made from cultured cream that is really yummy. I always stock up on a few packages when I am over there. Having made butter a lot of different ways, I’ve never really noticed a difference. The churn is purely for the aesthetics / historical connection, if I’m being completely honest with myself. Yes, raw milk will do all sorts of wonderful things naturally. With all the regulations out there, raw milk these days is pretty darn safe. I used it for most of my cheese making. I came back with a slice of GF bread to try the butter, but you were already gone and the sign was down for the pub… looks like it was a success. 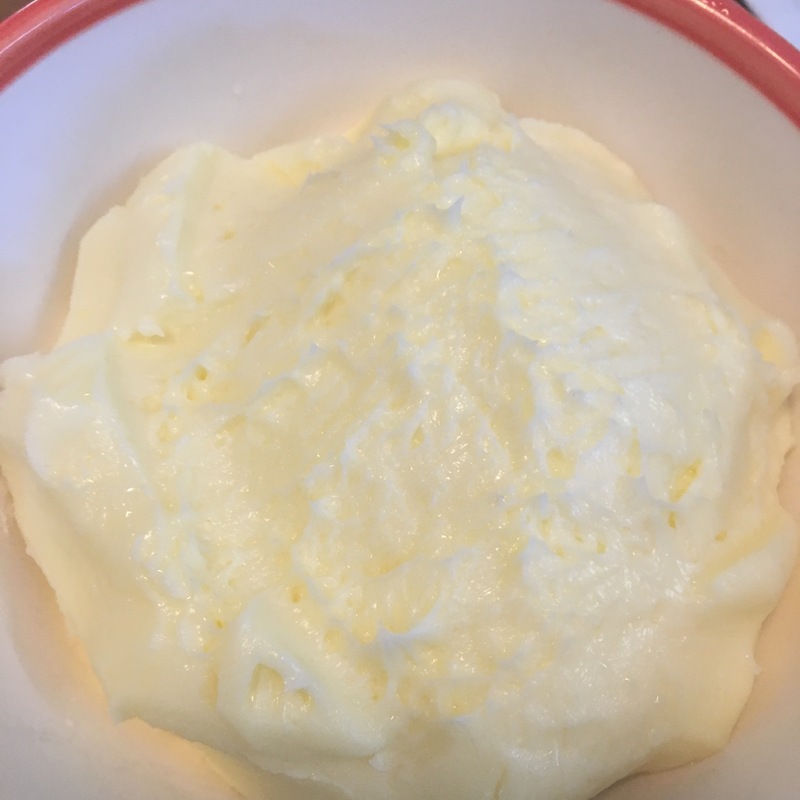 I made butter by accident once oops… I was shooting for whipped cream!! But I’ve never done it on a wooden churn. 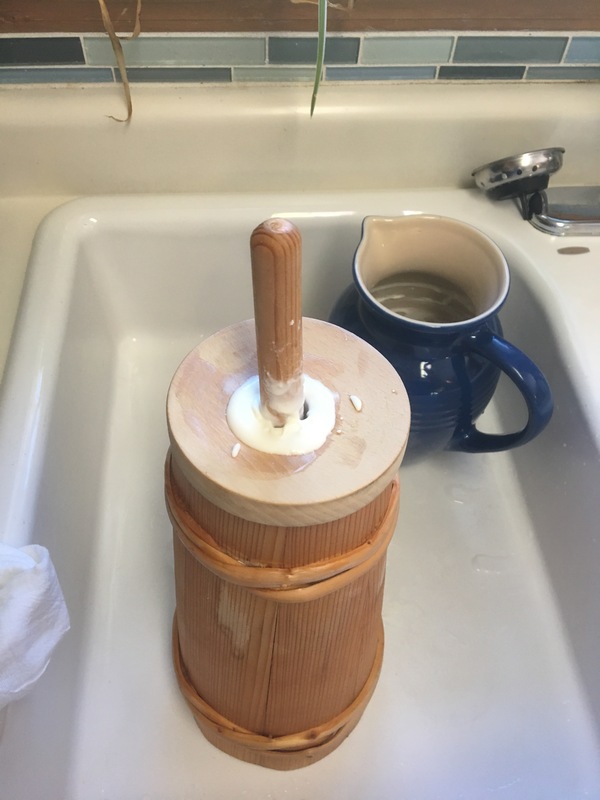 My mom had an antique glass and metal churn she used once to demo how to make butter to our Japanese student. She was amazed. 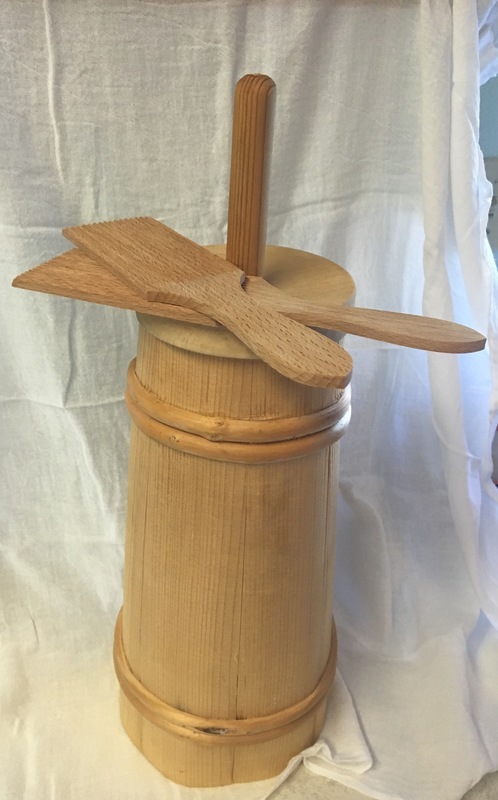 But your wood churn is much more neat looking!! !